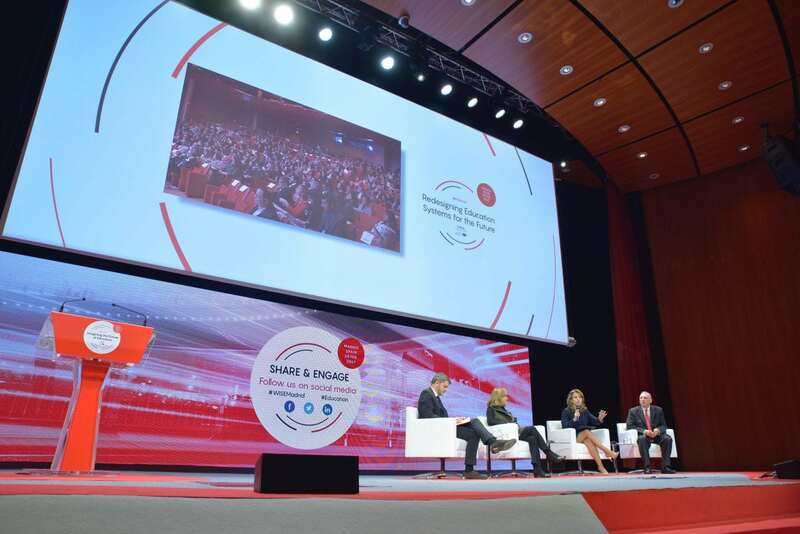 Nieves Segovia, President of SEK Educational Group, was one of the group of experts speaking at the Imagining the future of education forum, organised by the World Innovation Summit for Education (WISE) held at the Banco Santander headquarters in Madrid. The event was opened by the Vice Chairperson and CEO of the Qatar Foundation, Sheikha Hind bint Hamad Al-Thani, and the President of Banco Santander, Ana Botín. Nieves Segovia sat on the panel of experts on innovation in education entitled ‘Redesigning Education Systems for the Future’, a round table discussion where experts tackled the transformation and evolution of education systems in a world in constant evolution, which lead to a reflection on the principles, resources and innovation necessary to adapt and lead this change. Nieves Segovia made special mention of the role played by technology applied to learning and the need to invite more stakeholders to take part in the education debate. ‘We shouldn’t be the same stakeholders again and again, formal education, talking about the same issues, probably with the same mindset with which we created some of the problems, so we need to have many more agents, and this is one of the reasons why this event is particularly useful, because we’re not just education players, there are many others here today’. The President of SEK Group also alluded to the concept of life-long learning and advocated for the need to make it a reality. ‘We need to create a real learning flow, where there is a continued learning experience. This will allow us to have a new perspective on what learning is about’. Leaders and experts, among which were Marc Prensky and Stephen Heppell, debated on education and the future with the aim of putting forward global creative solutions that affect the teaching and learning model. Their talks hinged on four major linchpins, the future of education, redesigning education systems of the future, higher education in a changing world and new skills, with particular focus on entrepreneurial spirit as a driver for transformation. In line with her forthcoming presentation, Nieves Segovia has penned an opinion piece for the Summit, published in the WISE Ed Review (read here), in which she states ‘while many sectors are currently suffering disruptive effects in their activities, the education sector has continued, in the main, comfortably ensconced in its ancestral way of doing things’. Her article proposes a review of the education industry overall and questioning who, why, with whom and how children learn, with what resources, where and when, and of course how much.